Most people will know of Nicole by OPI. It branches from the ever-popular OPI nail polish brand and they have so many amazing celebrity-inspired collections! It's aimed at the younger market, which explains why they have so many awesome bright colours and glitters. Here's a bit of trivia; do you know who this brand is named after? I asked, and Nicole is the daughter of OPI's President and CEO, George Schaeffer. How cool would it be to call yourself the President of a nail polish brand?! I'm TOTALLY doing that one day! Recently Nicole by OPI NZ was kind enough to send me eight of their beautiful polishes to swatch and create some nail art with. I've made a chevron tutorial from some of the colours, which will be up on YouTube in a couple of weeks. This brand has recently been released in Countdown supermarkets here in New Zealand - for a very good price. A year or so ago if you were to buy an OPI polish from the shops, you'd be paying upwards of $25. However, these beauties are marked at just $13.99 - and often on sale for $10! I'm very excited about this trend - I really hope it leads the way for more affordable polish in New Zealand. If you've already puchased some of these, tag @nicolebyopinz and #liveinthecolourNZ in your swatches on instagram - they'd love to see them! Today I'll show you all the colours I received and give a short review of each. I love collaging swatches together! So pretty! Sheer Fun is the perfect base for a French polish, or if you're trying the new negative space look. I used it as a base in my upcoming tutorial, actually! It has a very subtle, reddish shimmer running through it, and this is two coats of the polish. Daffy Dill is one of my favourites; I find myself reaching for it over and over again! It's very bright, and very lime. It's a creme polish and this is 2-3 coats. Oh that's just Grape! is a lovely creme purple. It's very opaque - I barely needed the two coats I used. Like the rest of these polishes, the consistency was great and it applied very easily. City-Pretty Rose is a bright, barbie pink and it's so cool! It's a very girly, intense, creme polish. This is two coats. Please Red-Cycle is the most opaque of the lot - if your whites aren't as prominent as mine you could definitely get away with just one coat! While the colours isn't terribly unique, if you're looking for a good red the one-coat application is a great selling point. It's also a creme polish. This one is my absolute FAV! It's from the Carrie Underwood collection (big fan!) and is called Carrie'd Away. It's quite dense for a glitter, although if you wanted a finer look, one coat over black or white would look lovely. It's quite a yellow-toned gold, and it so beautiful and shimmery! This is three coats. Party Bus is a glitter top coat with heaps of different shaped, holographic glitters in it - check out that bottle! In the picture below, you can see two coats of Party Bus applied over Daffy Dill. I purposely scooped out one of the chunkier glitters for each nail, as the brush normally comes out with the smaller ones. Gotta go fishing if you want the big ones! Although to be fair, a couple did come out with the brush. Party Bus over Daffy Dill. I prefer this polish with just the smaller glitter anyway - here's one coat of Party Bus over Oh that's just Grapes! Love this combination. If you'd like to see what it looks like over other colours, check out Google Images. Party Bus over Oh that's just Grape! Finally we have A-Nise Treat, from the Gumdrops collection. It's inspired by liquorice - this whole collection looks to be based off candy! If you'd like to see some candy gumdrop tutorials, let me know ☺. It's a textured, sugary polish with a matte finish. I love the contrast between the silver and black here! This is 2-3 coats of the polish. Which one of these is your favourite? I can't wait to show my new tutorial using some of these - if you want a sneak peek, click here ;). 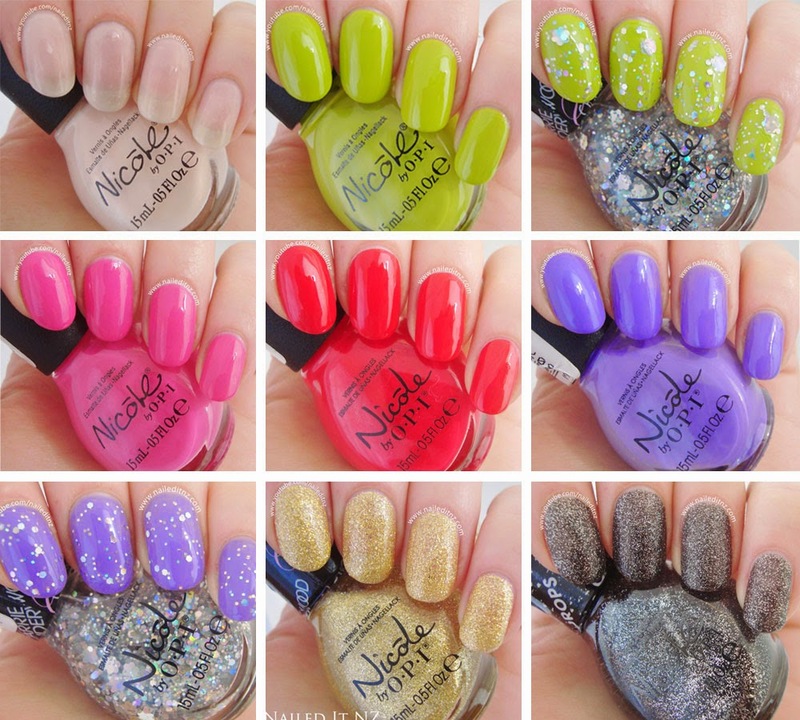 The polishes used in this review were provided to me for honest review by Nicole by OPI NZ. Awesome swatches of these colors. I'm really liking the cremes and glitters! Born Pretty Store Giveaway - THREE WINNERS! Spot The Dog | Tutorial & Collaboration!